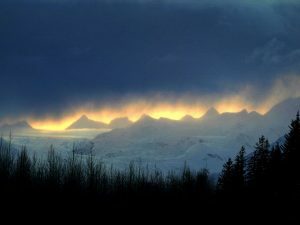 HomeNewsEarthquake ActivityOver 50 Earthquakes recorded since April 18: Why Alaska is so seismically active? This year, on April 18th and April 19th over 50 earthquakes were recorded in Alaska ranging from 0.5 to 4.5 in Magnitudes. Why is Alaska so prone to Earthquakes? The earth’s outermost crust is made up of Tectonic plates that are frequently moving. Being that Alaska is over the intersection of two great plates it is subject to more frequent seismic activity and Earthquakes. The two plates nearest to Alaska are the Great Pacific Plate, beneath the Pacific Ocean, and the North American Plate, which covers most of North America. U.S. Geological Survey researcher, Peter Haeussler compares the earth cracking to a chocolate bar bending and breaking on the surface, seeing as Tectonic Plates do not move and slide neatly, there is a lot of seismically active earth above these Plates that is directly affected. In the past, Alaskan Earthquakes have caused Tsunami Warnings to be issued for North East Vancouver Island Coast, as well as The Central Coast of British Columbia. Tsunami waves can become extremely large, having multiple waves (the 3rd and 4th being the most dangerous) and affect low lying areas under 20 meters. Sunday’s Earthquake originated 75m below ground and 53m offshore in a region of the Pacific Plate. 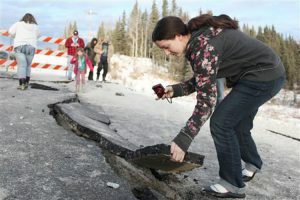 The Earthquake occurred at 1:30am Sunday and was powerful enough to rattle houses and startle people but it was far enough away from Anchorage, Alaska’s largest city, to damage buildings. Alaska will see more large earthquakes but U.S.G.S scientists have never predicted one. The agency calculates probabilities and focuses on long-term mitigation of earthquake hazards by helping improve structures safely. More than homes, an earthquake in the wrong place could damage infrastructure, such as ports and power transmission, rail or communication lines, which in Alaska have far less redundancy than other states. Due to the fact that an earthquake so far can affect us so closely, we recognize that preparedness for you and your family is essential. That’s why at GetMyKit.ca we have taken the thought process out of preparedness for you! GetMyKit.ca’s Emergency Kits are fully equipped with enough food, water, shelter and other survival amenities to ensure the safety and comfort of your family. These 72-hour Emergency Kits are guaranteed to last at least 3-5 days and are recommended by all levels of government should we suffer a large natural disaster.